Cape Town - American motorcycle manufacturer, Harley-Davidson, just introduced a brand new engine to power their range of touring bikes in South Africa. The new engine is the ninth in a long line that Harley-Davidson refer to as their “big twins”. The first of which was the Atmospheric V-twin used between 1909 and 1911 and followed by power plants with colourful names such as the Knucklehead, Shovelhead and culminating in this; the Milwaukee-eight 107. The Milwaukee-eight 107 replaces the Twin Cam 103 and offers a larger displacement, four valves per cylinder and a higher compression ratio. 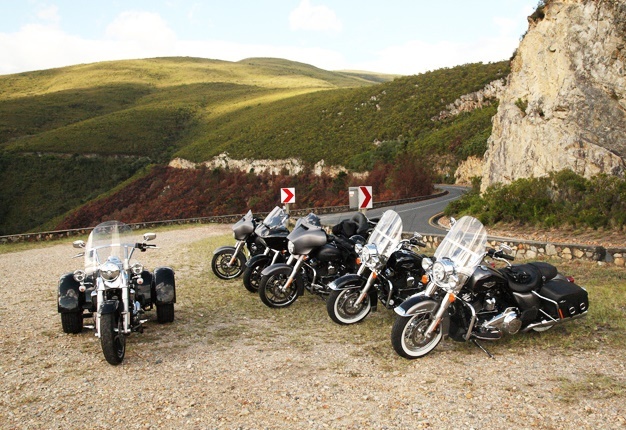 To put these bikes through their paces we embarked on a two day ride from Cape Town east along the coast to the whale-watching town of Hermanus. From there we headed inland via the Tradouws Pass to Barrydale where we stayed at the eclectic Karoo Art Hotel. On the following morning we left for Worcester, over Bainskloof Pass and through verdant vineyards back to a comparatively bustling Cape Town. Of the five motorcycle journalists present four were each given a variant on the touring Milwaukee-eight while the fifth rode an outgoing Twin Cam 103 Road King as a base for comparison. We'd continuously swop bikes along the route until we could all come to grips with the characteristics of the four new bikes. Upon arrival at the Cape Town dealership, none of us volunteered to ride this three-wheeled oddity. A colleague was eventually bullied into taking one for the team and he promptly rode over his own foot - having forgotten that there were two car wheels right behind his heels. Hatred for the Freewheeler seemed to ooze from his pores. I then had a go on this bike. The trick in mastering the Freewheeler, it seemed to me, is to ride it almost like a racing quad. You have to sit right up to the tank and bend your elbows. Additionally, there is no counter steering so you have to push the front wheel in the direction you want to travel and lean into the turn so that you don't get thrown off the opposite side. Riding the Freewheeler aggressively is immense fun if you are willing to put in the extra effort. I had no trouble keeping up with the other Harley's on Tradouws Pass and even managed to raise a few eyebrows - you just have to get used to the odd steering and the super light front wheel. Obviously lane-splitting in traffic is out of the question but at least you never have to worry about toppling over in front of your local watering hole. The reverse gear also helps a great deal getting the Freewheeler out of a parking space and the ‘boot’ has space for two helmets. Being the most traditional Harley on test, at least in appearance, you'd think it was also the most primitive, and in a sense you'd be right. There is little in the way of electronic gadgetry and the seating position feels like something from the 1960's. The whitewall tyres and leather saddle bags are pure rock 'n roll but they look a little silly in the 21st century - unless your love of all things 60's override your awareness of what others may think of you. Although the Milwaukee-eight 107 has 11% more torque than the Twin Cam 103, I couldn't really feel a marked difference in performance. The Milwaukee-eight did feel a little more lively, but it's hardly a leap into sports bike territory. The Street Glide was everyone's favourite when it came to swopped bikes. The gearbox was the smoothest and most refined of the bunch and the riding position felt appropriately laid-back with outstretched arms and legs. Unfortunately this isn't the ideal riding posture for tight mountain passes, but the foot boards will scrape long before you reach dangerous lean angles. The seat height is also the lowest of all the Harleys on test here and even the shortest of us should be able to manage just fine. The weight displacement is way down low, making it surprisingly easy to manoeuvre around town. The Street Glide is definitely my favourite. I liked the matt black paint scheme and the touch-screen display with onboard GPS and stereo system. On that note, don't ever use the radio! Nothing spoils the mood more utterly than hearing a broadcast about SA politics or rugby whilst out riding your bike. The general consensus was that the 'couch', as it was nicknamed, was the most intimidating after the Freewheeler - until you got it going. On the open road it was without equal. The 'batwing' fairing deflected wind and weather away so that I could enjoy the epic beats of AC/DC at 140km/h. It certainly looked the most impressive of all the bikes on test, and it had the most gadgetry. From cruise control to heated grips, it's all there. My biggest beef with the Road Glide Ultra is its top-heaviness. It's daunting to manoeuvre in and out of a parking space. I suppose one gets used to it, but I'd rather not live with the constant dread of dropping it and having to beg the local amateur wrestling team to help me lift it back up again. The name Milwaukee-eight 107 is taken from the hometown of Harley-Davidson, the number of valves and the displacement in cubic inches. The engine has a single chain-drive cam which requires less maintenance and produces less mechanical noise than before. Harley-Davidson also redesigned the exhaust system to direct heat away from the rider and thusly increase comfort levels. The engine isn't the only upgrade though. The front forks contain modernised innards and the pre-load on the rear suspension is now adjustable through a rotary knob. The engine generates 50% more electricity than before which means owners can power extra lights and other accessories without fear of depleting the battery. All in all Harley-Davidson produced a relatively modern bike whilst keeping true to their heritage.